Since its inception in 1933, B/W Liquid Level Controls have gained worldwide market acceptance as the most versatile, reliable way of controlling liquid level. By simply using the electrodes suspended in the storage tank, the electro conductivity of the liquid is used to cycle the pump as the liquid rises and falls in the tank. B/W also has a line of unique, patented magnetostrictive float sensors for fuel and other nonconductive liquids. 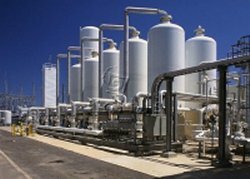 B/W Control Systems are used worldwide in food, beverage, dairy, chemical processing, wastewater treatment, potable water systems, and many other industries, and are ideally suited for agricultural applications as well. B/W Controls can be sold as individual components or complete systems, and can be custom-designed for any level control application, from simple one-pump/ one-tank systems, to multi-tank/multi-pump pressurized municipal and industrial applications. How Do B/W Controls compare to other solutions? B/W point level or continuous level controls are more precise and more reliable than pressure valves or switches. They neatly solve the problem of conflicting pressure switches when using a pressure valve for the fill-tank pump and another switch for the compressor. Pressure valves can also become blocked with debris and cause the entire system to fail. B/W electrodes are more reliable and rugged than radio or ultrasonic level measurement. The B/W induction relay is much more resistant to power surges than digital controllers. Time-proven over 70 years, B/W Controls are simple, rugged, and economical.